Lisa took my website ideas and turned them into an incredible design. She worked with me through the entire process, making sure I not only loved the results, but knew how they worked. Every time I’ve come up with something new I’d like added to my site, she’s found a creative, appealing way to make it happen. 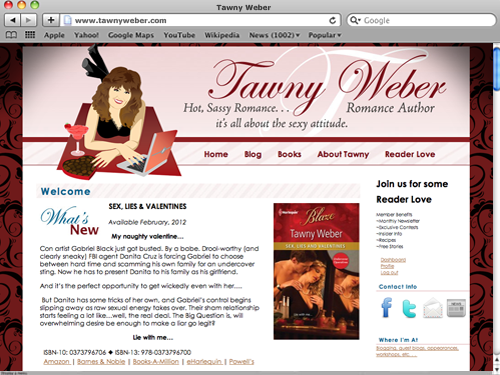 Romance author Tawny Weber was one of my first clients. We recently rebuit her site from scratch and refreshed its look. I widened the site, updated the typography, and added her Facebook and Twitter RSS feeds. Tawny’s site utilizes WordPress as a content management system with included blog and a custom theme inspired by the portrait of her drawn by her brother Ron Weber. This custom theme takes advantage of the now built-in Sidebar Widgets as well as several plug-ins including: Democracy Polling, Event Calendar Widget, and a Lightbox photo gallery. Tawny also uses MailChimp for management of her custom designed quarterly e-newsletter. Tawny’s website has been a Screenalicious featured design.